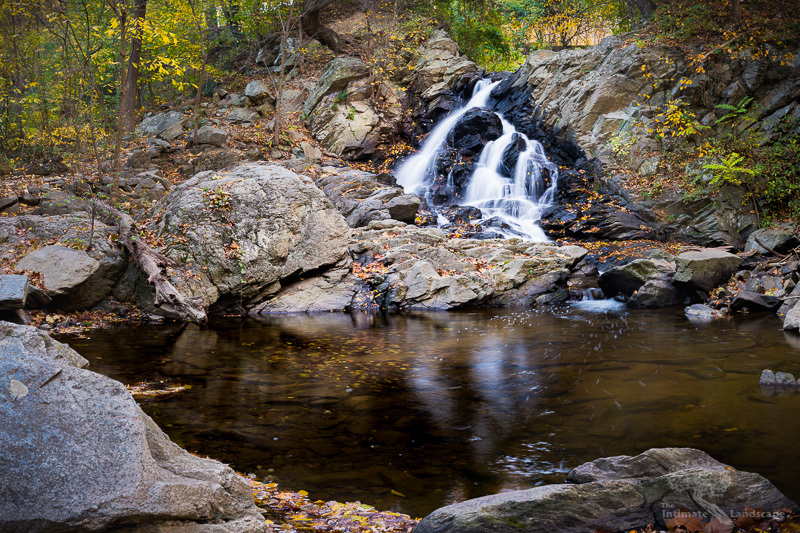 In my last post, I mentioned the waterfall on Piney Run where it meets the Potomac River near Harper’s Ferry. Today’s image is that waterfall. I will also admit something I’m somewhat embarrassed about: the fist time I was here, I completely missed this waterfall. I never saw nor heard it, and it’s only a short bit off the trail between the parking area and the Potomac. My only excuse is obliviousness. Now that I know it’s there, however, I plan to visit it often. I’m curious what it looks like a little earlier in the year when the sun is higher and possibly shines through the trees, lighting the fall with dappled light. Check back next year! This image is a collage of 15 vertical images shot with a Nikon D800 and a Sigma 50mm ART lens. The image is cropped a bit from the full assembly. The exposures for each image were 1 second @ f/11 and ISO 100. This entry was posted in Landscape Photography, Potomac River and tagged autumn, Fall Colors, Harper's Ferry, leaves, river scenes, Rocks, Trees, water, waterfall.